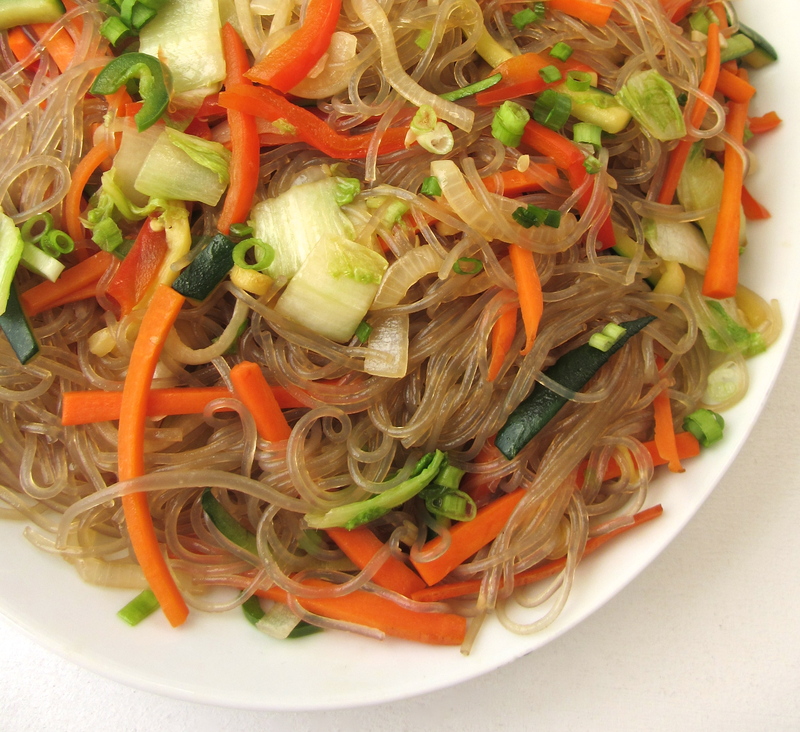 One of the more popular of Korean foods, Japchae (commonly pronounced: jap-chay, job-chay, or chap-chay) is a sweet potato noodle dish traditionally made with stir-fried vegetables, beef, and topped with sesame seeds. Like most Asian foods, the idea of cooking this dish looks more complicated than it actually is. The hardest part of this recipe is the vegetable prep work; it does take some time to julienne all the vegetables, but once your knife skills and confidence with a blade increase, getting all those vegetables across the chopping block will be a breeze. Since we’re on the topic of chopping, let’s talk about the julienne cut: it is the proper culinary term for cutting food (though primarily vegetables) into thin strips, similar in size to a matchstick. When cutting food into a julienne, it is important to have a sharp knife and a steady hand, to minimize risk of injury since the blade and fingers will be working closely together. Or, a mandolin slicer fitted with the proper blade will work just as well. My version of Japchae came about when I was tasked to make a vegan meal for a friend. I realized that aside from the beef, all the ingredients were vegetable-based, even the noodles. And you know what? I didn’t miss the meat one bit. 1. Bring a large pot of water to boil. While the waiting for the water to boil, prepare the vegetables. Slice the onion into 1/4 inch strips. Cut the bell pepper, zucchini, and carrots into a 1/4 inch julienne. Coarsely chopped the cabbage into 1/2 inch pieces. Thinly slice the jalapeno, garlic, and green onion. Peel and smash the ginger. 2. Cook the noodles in a large pot of boiling water until they are clear and tender to the bite, but not mushy (about 6-8 minutes). They should be “al dente,” much like how a pasta noodle would be. Drain the noodles and thoroughly rinse with hot water to remove excess starch. Allow to drain, then transfer them to a large bowl and toss with the sesame oil, soy sauce, and sugar. Set aside. 3. In a large wok (or sauté pan) set over a high flame, heat one tablespoon of olive oil, then add the piece of ginger. Working in batches, sauté the onion, bell pepper, zucchini, and carrots until bright and tender, but still a little crisp. Cook each vegetable one at a time, removing and setting aside before cooking the next. Leave the ginger in the pan to flavor each vegetable as it cooks. Add more oil to the pan as needed. 4. Remove and discard the ginger. Add another teaspoon of olive oil to the pan, then cook the jalapeno and garlic until fragrant, about 30 seconds. Add in the cabbage and cook until the leaves begin to wilt. 5. Reduce heat down to medium/low. Return all the cooked vegetables and green onions (reserve a small handful for garnish) to the pan. Toss to combine. Season to taste with salt and pepper. Keep in mind the noodles are seasoned already. 6. Add the noodles to the pan and toss to combine until noodles are heated through. Season with more sesame oil and soy sauce as needed. Turn the noodles out onto a large platter, sprinkle reserved green onions over the top. Serve family style. * The noodles are long, so can be difficult to toss. Cut them with kitchen shears to make the job easier.